This is an older piece, from my Just Being Frank Column in the Arcata Eye. It was originally published on December 7th, 2004. It is still relevant. This post is an edited version of that original. My youngest son is no longer seven, he’s almost eighteen! I hope you will appreciate these thoughts and perhaps understand a little more about what being Jewish is like at this time of year. Now mind you, we do not own a television. Our youngest son doesn’t watch television at home and is allowed an occasional ½ hour at the neighbor’s house or an occasional hour at his friend’s house if he’s visiting over there. So, his mainstream exposure results in an average of about three hours a month. This is a very reduced amount of cultural exposure impacting his seven-year-old brain. He goes to a small school where they do a lot less of the Santa stuff. Still, he thinks Christmas is cozy. We have a Jewish home and celebrate Jewish holidays in it. We participate in other folk’s celebrations from Eid al-Fitr celebrations connected to Ramadan to Losar the Tibetan New Year but not generally in our own home. We have never celebrated Christmas. Channukah gets turned into an alternative Christmas by many Jewish parents in order to confront this image of coziness. Gift giving at Hannukah (it can be spelled and celebrated so many different ways) is very new. It’s the result of modern American Judaism needing to find some alternative for their children during a time that makes them feel different or less special. As a confident adult, my feelings of difference aren’t going to cause me any lack of sleep. For children it’s just not the same. And there’s the whole consumer present thing. I mean no disrespect to all the vendors and artisans whose livelihoods are dependent on the buying which folks do at this time of year. I’m delighted if folks buy local art, music, foodstuffs, crafts or other Humboldt County creations. Unfortunately most folks are shopping at Old Navy or massively stressing themselves, their credit cards and/or their families out. In December of 2003, I was in a car accident when two twelve-year old girls thought it would be a good idea to go for a joy ride. They came out of their driveway late at night with no lights on, during a wet and rainy night. They struck me, and dented my car and also ran over a water main pipe. I was driving home from my gig on the Arcata Plaza teaching and singing Chanukah songs. It was a wet mess, but no one was injured. They did run away and drove off, leaving me to confront the police and the grandparents, in the rain and water spuming and sloshing side of the road. So, this year being told Christmas is cozier than Channukah seems mild in comparison. I’m not the kind of parent that enforces her beliefs on her children or even on others or my spouse. I’m an equal opportunity believer. The only caveat to that is while your beliefs and mine do not have to be the same, I do not allow my children, or folks in my home, to engage in behavior that hurts others physically or emotionally. You’re just not welcome at my place if you need to insult others, condemn them to hell, or use racist, sexist, or homophobic language. While you might not be welcome in my home if you engaged in these behaviors, I’d still agree to meet you for tea somewhere else and try to understand you or work hard to find common ground with you. I’m not fond of burning justice; the two terms are oxymorons in my opinion. Burn and justice don’t really belong in conjunction with one another. Burning crosses on lawns, burning Jews, burning Iraqi children with American bombs, burning Vietnamese people with Napalm, burning our planet with toxic wastes, are just some forms of burning, I don’t associate with justice. Other than that one line in one song though, it was lovely. I was also invited into Arcata’s Pacific Coast High School (on the Arcata High campus) to talk about Judaism for two World Religion classes there. They want me back for their panel discussion with other folks from different religious paths. I am continuously moving along on this journey of dialoguing with people who see the world differently than I do. 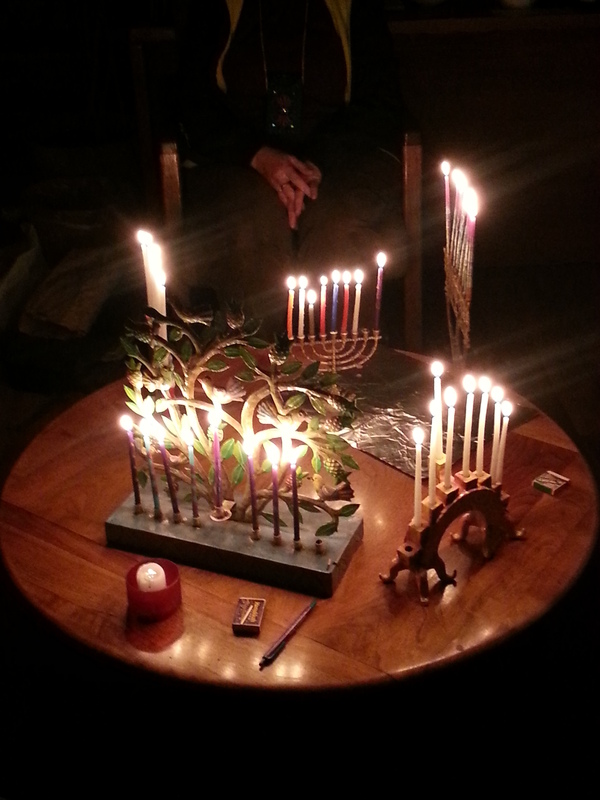 These conversations are a kind of light kindling that resonates more closely with Channukah. It’s not about eight days of presents. It’s about finding something to be grateful for, some new light shed on an old problem and because we focus on it for eight days we get to see the light growing and hopefully end up a little wiser. Hanukkah is actually a very cozy holiday, full of family, food, friends and beautiful glowing candles. So, I invite you to kindle some light in your homes and in your hearts and shed some light on any places in your life that need more than just one candle’s worth of illumination. ~~~~byline ~~~~ Nicole Barchilon Frank, lives, loves, prays, struggles and is cozy in her home in Northern California and she is always looking for a way to make Hanukkah and the world cozier for all children. My least favorite comment this time of year is when I’m asked by shopkeepers, “Are you ready for Christmas yet?” Well, yes I am, I guess. I’m as ready as I’ll ever be. Happy Chanuka, Nicole. Thanks for your thoughtful observations. The Most High Elohim Hashem Jehovah is very clear what we should remember. Also the Nazarene man born in Bethlehem, 4BCE October 17, asked also to remember what he did on Nisan 14, and clearly told his disciples, living in this world, not to be of this world. All those who love God should keep to the Wishes of God , follow His commandments and should not mind to leave the pagan feasts like “Christmas” and “Easter” at the side but should have the Pesach, 1-15 Nisan as their most important days of the year. Christians remembering the day Jeshua installed the New Covenant (14 Nisan) and like the Jews also the Exodus of the People of Israel out of Egypt.